The score sheet from the U14 Project at Targhee is attached below. It can also be found on the U14 results page. Results from the dual giant slaloms, dual slaloms and Kinder Kombi at the Spring Project at Targhee are in. Slalom results from the Snow Cup at Snowbird Sunday are in. 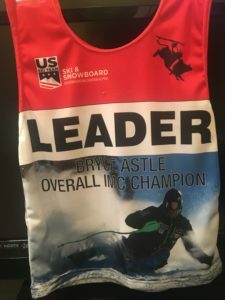 Justin Bigatel or Park City and Sophia Tozzi of Jackson Hole, owners of the series leader bibs all season, won the Bryce Astle Intermountain Cup Overall awards for 2019. We will post all of the winners Monday. This is Steve Bounous’ last race weekend as Snowbird Ski Education Foundation Executive Director and Head Coach. He has decided it is time to retire. He has built a strong Alpine program at Snowbird and produced many, many world class skiers and great human beings. Enjoy some video clips of Steve forerunning and course setting. Here are some photos and video from Heather Walker. If you have some Steve Bounous photos or videos to share, let me (gerdt@imdalpine.org) know about them and I will add them to this post. Tune in Thursday for the Giant Slaloms at Snowbird. They will be broadcast live. Also, archived videos of each competitor’s runs will be available after the event. Once there, go look for the Snowbird events. Snowbird will video the entire race series, so come back Friday, Saturday and Sunday for more. Giant Slalom, Slalom and Super-G results from the Tri Divisional Championships taking place in Jackson are in. Congratulations U14 Spring Project invitees. Download and read this: 2019 IMD Spring Project Announcement. Please complete all of the steps below to sign up for this project. Download, fill out, sign these two forms and bring them with you. Here is a link to the pulls and confirms board. All results from the Western Region U16 Championships at Sun Valley are in. Giant Slalom, Slalom and Parallel Slalom results from the IMD Championships at Snowbasin are in. We are excited to offer this competition project at Vail Colorado on March 30-31, 2019. Intermountain development projects are included in the U.S. 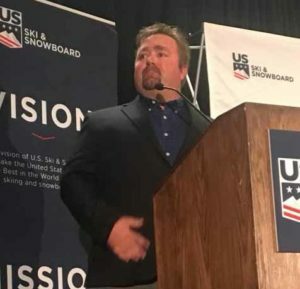 Ski and Snowboard pipeline leading to the Western Region, National Performance Series and the U.S. Ski Team! You have self selected into this system through your results and efforts over the past season. Click here for the project board. Coaches, use this link to do your confirms and pulls. Projects are offered in a progression of experiences over the duration of your junior racing career. This project introduces the athletes from the Intermountain to experience an out-of-region race. The project is designed to focus on bringing the best IMD athletes and IMD coaches together to enhance their experience and build friendships with fellow IMD athletes. We are excited to offer this opportunity to the top six athletes born in 2006 per gender. Giving us a total of 12 outstanding IMD athletes. Please contact your coach and confirm your attendance by March 14. We appreciate your efforts in a providing a quick response as we need to confirm our final numbers for our lodging plans. Here is the waiver for the project. Congratulations on qualifying for the U14 Regional Championships at Big Sky. Good luck to all of you. Here are the steps you must take to finalize your team membership. When the race announcement and additional information become available we will post them here. We were just informed by Sun Valley Company that a freeski of the super g venue from 2-4 p.m. on Wednesday the 13th will be available to the athletes. The start for the freeski will be slightly lower than the actual start and the finish for the freeski will be 2 gates higher than the actual finish. This allows some of the runs that will be closed for the race to stay open, but still provide the athletes an opportunity to ski the hill and see the terrain. We ask that 3 coaches volunteer to help us with eyes on the hill during the freeski. They can pick up radios at the start of the venue at 1:30. Please let me know which coaches would be willing to lend a hand. The giant slalom and slalom results from the Youth Ski League Championships at Brian Head are in. Congratulations on qualifying for the U16 Regional Championships. Good luck to all of you. The boards for the U14 and U6 Regional/Tri Divisional selections are now online. Here are the race announcement, schedule and Western Region flyer for the U16 Championships at Sun Valley, March 14-17. The race announcement for the Intermountain Division Championships at Snowbasin are online. Giant Slalom and Parallel Slalom results are in from the Park City David Wright Memorial. Results from all three days of the Laura Flood Memorial at Sun Valley Saturday are in. The race announcement for the Snow Cup at Snowbird is online. The race announcement for the Intermountain Division Finals at Snowbird is online. The race announcement for the Tri-Divisional Championships at Jackson Hole is online. The race schedule for the upcoming 2018-19 season is online.